1. To add a Page Counter you just need to click the Page Number button in the Add Text section under the Insert tab. 2. 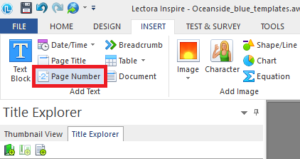 A window will open where you can choose if you want to count the pages in the whole title, chapter or section (Scope). 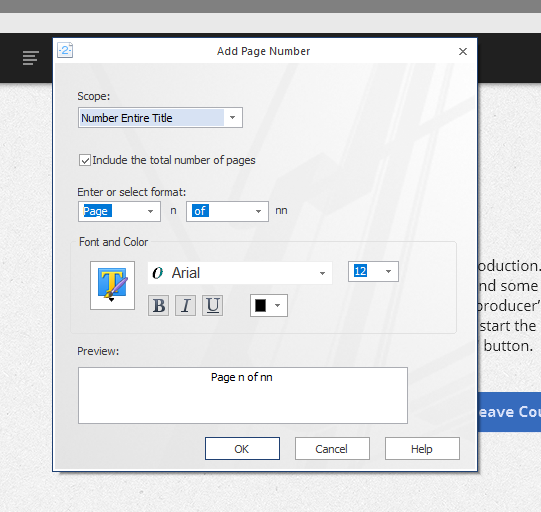 You can also choose the format that the page counter is displayed in and the font and color of it. At the bottom of the window you can also see a preview of your page counter. After it’s styled to your liking go ahead and click OK.
3. After clicking OK the page counter will be added to the top left corner of the page you were viewing. From there you can just drag it to wherever you would like it to be. You can also either copy it to other pages you would like it to apear in or you can drag it in to the “Global scope“ to make it apear in all of the pages.